Chris is back in his lab after a week and a half of travel; Dave continues to trick out his lab to take advantage of his high speed internet. Chris has road-tested the portalab! There isn’t enough lighting, nor time in the day to work on it. Does solder have an expiration date? Dave is going lead-free in his lab. Flux pens can be nice, but pricey. No clean flux isn’t worth it. In the late 80s, there was a push to use citrus cleaning solvents for boards (PDF). Chris was still in San Francisco for SolidCon (you can see the schedule here). It’s meant to be a conference for the crossover of hardware and software. Videos should be online eventually. Dave doesn’t understand why people would speak at conferences without someone taping it. On interesting protocol that Chris learned about was MQTT, a lightweight way for machines to interact. This is what Facebook uses for their notification. A similar topic was covered by Peter Semmelhack and Stacey Higgenbothom on the Internet of Things Podcast. The new platform (vs protocol like MQTT) is called dweet.io. The “hard” part of hardware is the manufacturing and distribution side of things. Brady Forrest of PCH Int’l and Highway1 gave a talk about how there is “No China Button”. During the meetups on non-conference days it was crazy to see how much ferver there is over hardware (and really tech in general). Quirky is opening a new SF office and hiring up to 60 hw engineers. Outside of SF, Tony Hsieh (the Zappos guy) has invested $10M in US manufacturing (specifically in Las Vegas). Another investor, Renee DiResta of OATV, gave a presentation about the state of hardware startups and revealed the cost of labor in Mexico are falling past those in China. Dave was impressed by the growth of hackerspaces/makerspaces (where do they go when a big city has them?). Chris’s favorite presentation was by Nadya Peek, a PhD candidate in the MIT Center For Bits and Atoms (Neil Gershenfeld‘s group). The talk focused on modular machines building reconfigurable tools for manufacturing. If you’re interested in the building your own Portalab, there is a lower cost case offered by Digikey. Mentor and Digikey are pairing up for a low cost CAD tool. At first glance we didn’t realize the $300 price tag only gets you schematic capture. Boo. The “Never trust the autorouter” t-shirt is now available for sale on teespring. Can solar roadways work? There is a crowdfunding project raising money for further research. Chris and Dave agree that feasibility on a large scale road would take a long time to implement. 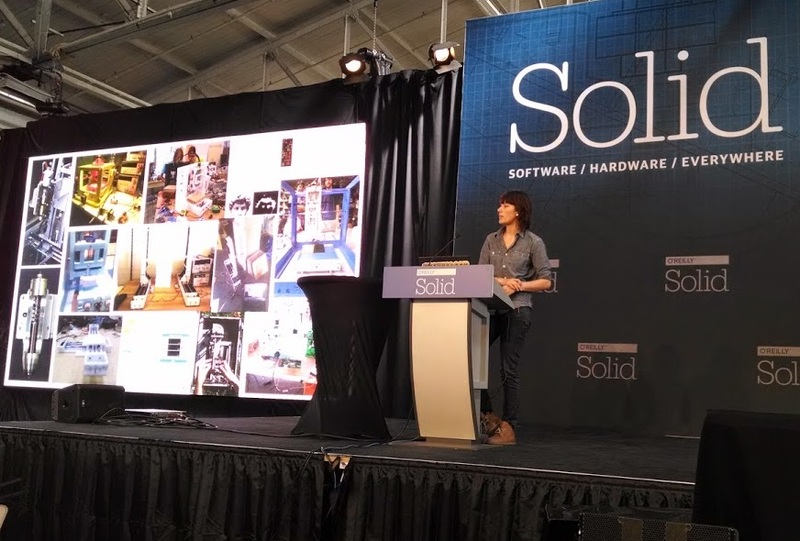 Another group at SolidCon was the Makani wind turbines/kites. Chris made a comparison between the derision that smokers receive and people wearing Google Glass. There are a wide range of reactions. NASA is giving amateurs the chance to recover a long lost satellite out in orbit. TI is auctioning off the first microchip that Jack Kilby made. It is expected to sell for $1M+. Chris has been doing field research and hardware people are still cheapskates. Are any of our listeners a counter point? Re listen to Marcus Schappi (#189), enjoy free time/quality of life improvement instead of doing every single minimum wage job you need done. Keep moving up in the food chain. Instead of hugging ucurrent spend that time designing 5 other little gadgets. If Dave says something, but there was no one to record it – did it really happen? But repackaging stable releases under DaveCAD name is a solid plan. Dave could build whole company around supporting Kicad. He doesnt even have to learn it, just build community, filter out most knowledgeable and enthusiastic people, make them moderators and offer to pay for solving customer problems in internal paid section of the forum. Be a trusted middle man, source of confidence in Kicad as a mature product. A portalab would be great for hardware hackers at Hackthons… I may have to make one for next fall’s MHacks in Ann Arbor, Michigan. Great show as always, I really like the mobile lab, at one point I made a small one for my car, so I could work on projects between school and work. I tried listening to the The Internet of things podcast… I cannot recommend it. congratulations on the 200th show guys! You will soon have been running for 4 years – scary thought! Found you Anglophones on Science360 radio, and it’s the one scheduled podcast where I understand virtually nothing. But asphalt is cheap.. Happy 200th! The lower cost Portalab case from Serpac mentioned in the show is actually made in the USA as opposed to what was stated in the show. It’s a nice little protocol for lightweight communication in systems from home automation right up to bigger systems like smart meters. There are arduino and other embedded libs out there which make it really easy to link in sensors / physical actions in bigger systems. About who made the “first” IC. Kilby wire bonded several of the circuit nodes together to get the first chip to work. Fairchild in my collections, than the Kilby device. For an alternative to Pelican cases. I’ve found that Explorer brand cases offer similar models and cases with about the same cost as Serpac. I was listening to your podcast this morning and at the end you said you wanted to hear from hardware engineers that spend money. Well, I am one! I have worked in several companies as a permanent EE since I graduated in 2002. Over 10 years my salary increased from £20K to £36K. It’s not great but far above minimum wage and yet I never had any money left over after bills were paid. I drove cheap throw-away cars that I repaired myself; I had time but no money. In 2012 I stopped working for the man and and last year I had a little boy. Now my situation is reversed; I have plenty of money but no spare time! Now when I want a new gadget I don’t have time to search for the best price or fight with cheap retailers that don’t deliver; I go to a trusted retailer and pay their premium for good reliable service. In a business environment I believe in spending money on good equipment. It costs a lot of money to hire engineers so you need to keep them busy. Saving a few hundred pounds buying a budget power supply might seem like a good idea but when it breaks you a) damage the prototype boards you were in the middle of testing, b) waste time fixing/returning it c) eventually have to buy a better one anyway. The cost of a new piece of kit might be less than the cost of getting multiple quotes, discussing it with purchasing, your manager, his manager and trying to persuade someone in finance to sign off the capital expenditure… Nice kit is less likely to stay unused in a cupboard and it holds its price for longer so it’s an asset. Buy cheap, buy twice. That’s my opinion and I’m sticking to it! Good work guys, love the show. Any update on The Second Machine Age book mentioned a couple weeks ago? Seems the book reviews have a strong start but never get the final verdict! melted off during the solder process. Have resorted to giving the rolls a bit of an occasional scrub to remove the grime.